Today I made another Halloween card using two different stamp sets. 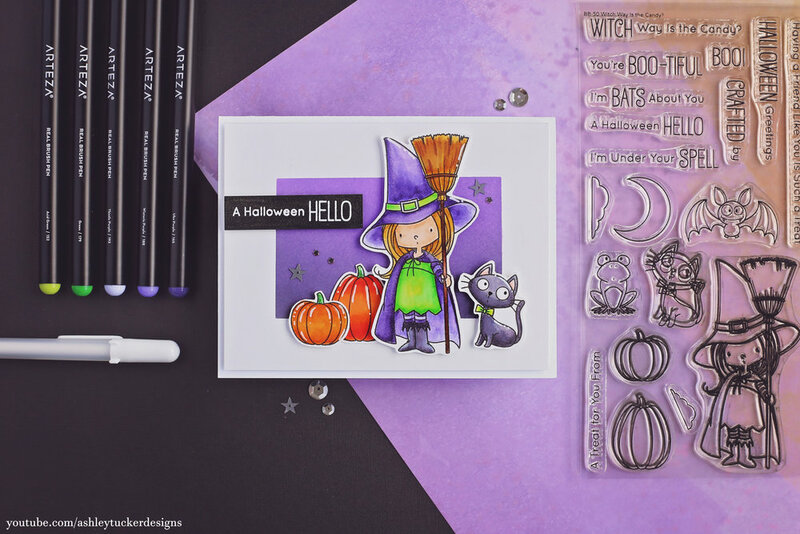 I used the "Witch Way is the Candy" stamp set by My Favorite Things and the "Creepy Cute" stamp set from Simon Says Stamp. I started out by stamping a bunch of pumpkins on a black piece of card stock with Versamark ink. I embossed these pumpkins with a white embossing powder. Next I stamped a bunch of stars to fill in the spaces between the pumpkins and embossed those in a clear embossing powder. I colored the pumpkins using my Prismacolor pencils. I used a white pencil and a black pencil and shaded them using a negative technique. So for the negative technique I used white for shading and highlight with the black. I was inspired by film photography for this coloring. In film photography the film is your negative. The lights and the darks on the images are inversed on the negative because when you develop them they inverse back. I also used my blender pencil a little bit for this coloring. For my sentiment I chose a stamp from the Creepy Cute stamp set that says "Boo!" I stamped it with my MISTI tool on some white card stock using Simon Says Stamp intense black ink. I cut the sentiment paper down to a small rectangle and glued it to a piece of vellum so that it has a nice vellum border. I took a piece of Gina K Tangerine Twist card stock and glued it to a card base. Then I adhered my pumkpin background to that with foam tape. I popped up my sentiment on the card with some foam tape as well. For the finishing touches I added a bunch of purple half pearls to the background to fill in some empty spaces. I glued them down using my Gina K Connect glue. I then went over the letters of the sentiment with my Wink of Stella glitter brush. 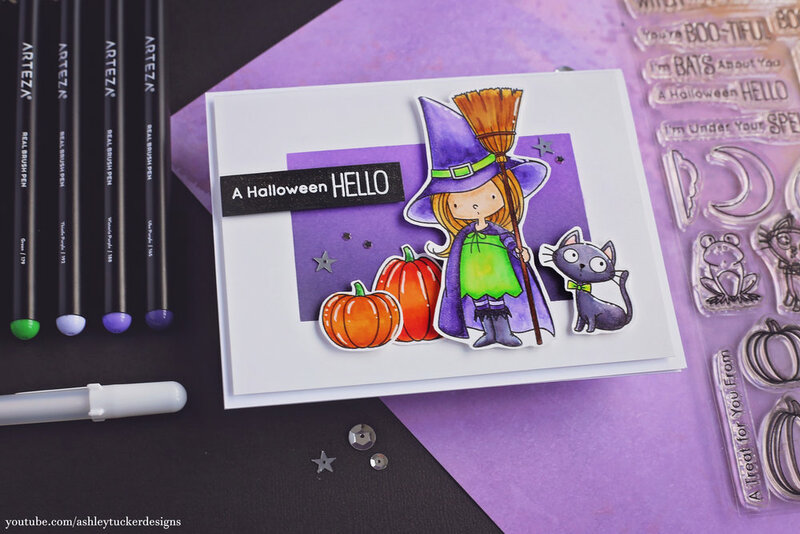 For today's card I used the Witch Way is the Candy stamp set from My Favorite Things. I started by stamping four of the images from from the stamp set onto some Bristol Smooth paper with Simon Says Stamp intense black ink. I colored them in using my Arteza Real Brush Pens. Check out the video to see the coloring in detail. Once the coloring was done I fussy cut the images out with my scissors. Next I taped a piece of Bristol Smooth paper to a board to create a background. I made sure to lay down the tape so that it was flush with the paper edges so that I had nice straight lines and an even boarder all the way around. I then blended two colors of Distress Oxide ink on the paper to make my background. I used the colors Wilted Violet and Black Soot. I popped my background up onto a card base with foam tape. I then glued down my colored in images using Tombow Glue and Foam tape. 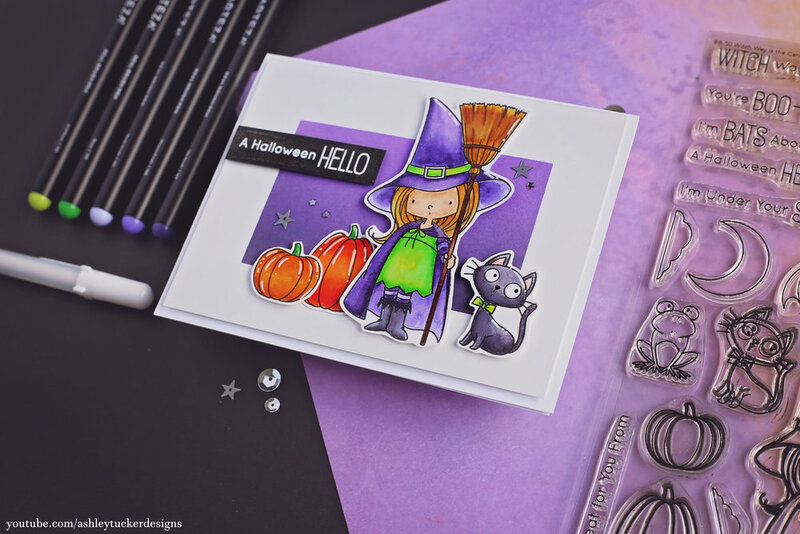 I created a sentiment for my card using a stamp from the set which says "A Halloween Hello." I heat embossed the sentiment with white embossing powder on black card stock. I cut that down to a strip and popped it up on my card. For the finishing touches I went over the sentiment and the witch's hat and cape with my Wink of Stella glitter brush. I added highlights to the images with a white gel pen. Finally I added two different sized of silver star sequins with my Tombow glue. Today I want to share a card I made using products from My Favorite Things, Lawn Fawn, and Simon Says Stamp. First I started with a piece of Canson watercolor paper taper down to a board. I painted a very simple background using my Gansai Tambi watercolors. I used color numbers 37, 139, and 38. Next I stamped two of the pumpkin images from the My Favorite Things stamp set "Which Way Is The Candy." I took out some of the cute little faces from the Lawn Fawn stamp set "Thanks a Bushel" and stamped them on my pumpkins. I colored in my pumpkins with Copic markers. I used YR02, YR04, and YR07 for the main portion of the pumpkins and for the stems I used YG17 and YG67. For the sentiment I chose a stamp from the Simon Says Stamp stamp set "Simple Sentiments No. 1." The sentiment says "Love Your Guts." I thought that that was hilarious and worked well with the pumpkins. Because...guts...pumpkins...get it?! I stamped the sentiment on black cardstock with Versamark ink and embossed it in a white embossing powder. I glued the sentiment strip onto a piece of vellum to give it a little bit of a border. I popped up my watercolor panel to a card base with foam tape. I also popped up my sentiment and pumpkins onto the watercolor panel. Then I used my black Prismacolor pencil to add a drop-shadow under the two pumpkins. 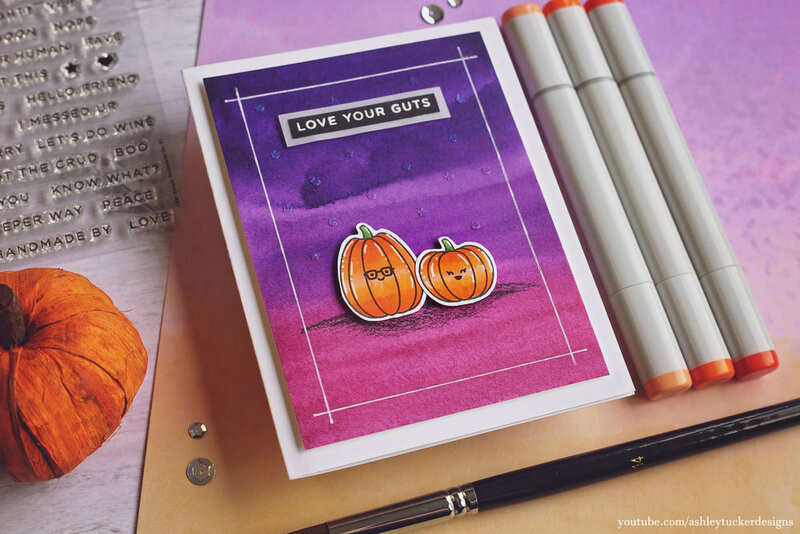 For the finishing touches on this card I added highlights to my pumpkins with a white gel pen. I also took the gel pen and added a border on the watercolor panel using my T-square ruler. I added a ton of tiny star sequins above the pumpkins using Tombow glue. Finally I went over the sentiment with my Wink of Stella glitter brush. 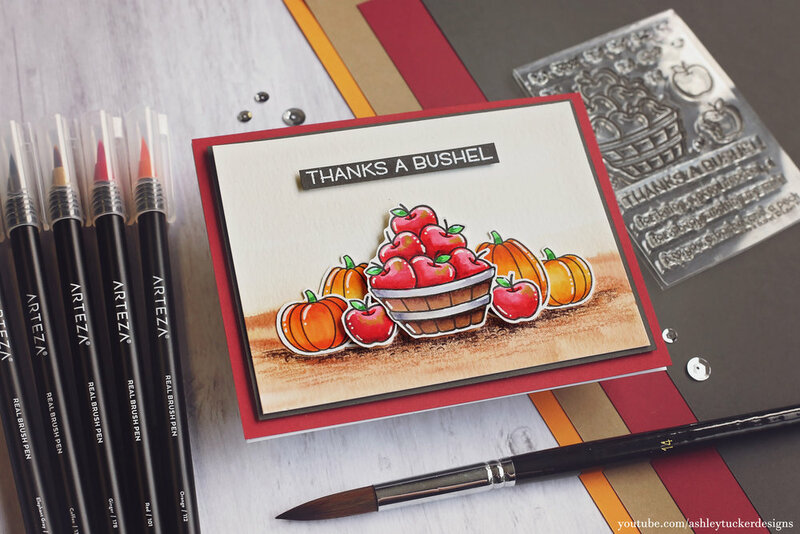 For today's card I made a fall themed thank you card using a couple of older stamp sets. I started out by stamping some images from the stamp set "Thanks a Bushel" by Lawn Fawn and the "Witch Way is the Candy" stamp set by My Favorite Things. I used the apple images from the Lawn Fawn set and the pumpkins from the My Favorite Things one. I stamped those in Simon Says Stamp intense black ink onto some Bristol Smooth paper. I then colored in the images with my Arteza Real Brush Pens. I also added some PC913 Prismacolor pencil to the apples. Check out the video for details on the coloring and to find out the colors used. Next I created a background to place my colored images on. I taped a piece of Canson watercolor paper to a board. I scribble some of my Arteza markers onto a palette and then picked up the color with a paintbrush to watercolor. I wanted to paint a dirt ground background for my images to sit on to kind of give you the feel that it is a farm scene. I used the colors Ginger and Chocolate to paint my background. Next I used my ATG gun to glue a piece of red cardstock to a card base. Then I glued my watercolor background to a piece of dark gray cardstock that was just slightly larger so there is a small border around the edge. I then popped that piece up onto the card base with foam tape. I glued down my pumpkins to the background using Tombow glue and popped up the apple images with foam tape. I used a white gel pen to add highlights to all of my colored images. Next I used some Prismacolor pencils to add some shading and texture underneath my scene. I used the colors PC946, PC947, and PC943. To create my sentiment I used the stamp from the Lawn Fawn set which says "Thanks a Bushel" and I stamped it with Versamark ink onto some dark gray cardstock. I embossed it in a white embossing powder and then cut the sentiment down to a strip and popped it up on the card with foam tape.